YEREVAN.- The survey revealed 66 percent of respondents are ready to vote for Armenia’s incumbent president Serzh Sargsyan. Balltic Surveys/The Gallup Organization and Armenian Sociological Association conducted the second opinion poll ahead of the presidential election. Representative of Balltic Surveys Rasa Ališauskienė said 10 percent will vote for Raffi Hovannisian, and four percent for Paruyr Hayrikyan and Hrant Bagratyan. Only one percent for Aram Harutyunyan, while Andreas Ghukasyan, Arman Melikyan and Vardan Sedrakyan will be supported by less than one percent of respondents. Sixteen percent said they are undecided. 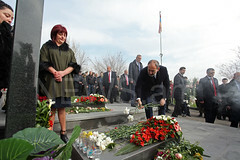 Talking to reporters on Tuesday, Ališauskienė said Republican Party of Armenia and Heritage expanded the circle of their supporters, while Prosperous Armenia has lost a part of its voters because of the decision not to participate in the vote. The second survey showed that television has become the first and most important source of political information during the campaign events. It is followed by Internet which has an important role for young urban voters. The election campaign season will come to an end on February 17 at midnight, local time. 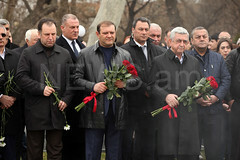 The sixth presidential election in Armenia will be held on February 18, from 8am to 8pm. 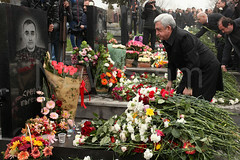 The President of Armenia is elected for a five-year term.